Morocco is a woman’s paradise for culture, food and magnificent markets. Want to discover Morocco’s Sacred Spaces, Imperial Cities, Ancient Kasbahs and Berber villages with other likeminded women? Visit Morocco! Join our Just for Women Tours or let us create a tailor-made group journey of your own. Cook, bellydance, trek the Sahara and attend a henna party. Travel Exploration’s Morocco tours for women offer a combination of luxury and adventure. Trip prices to Morocco include a FREE cooking class or balloon ride over the Atlas Mountains. 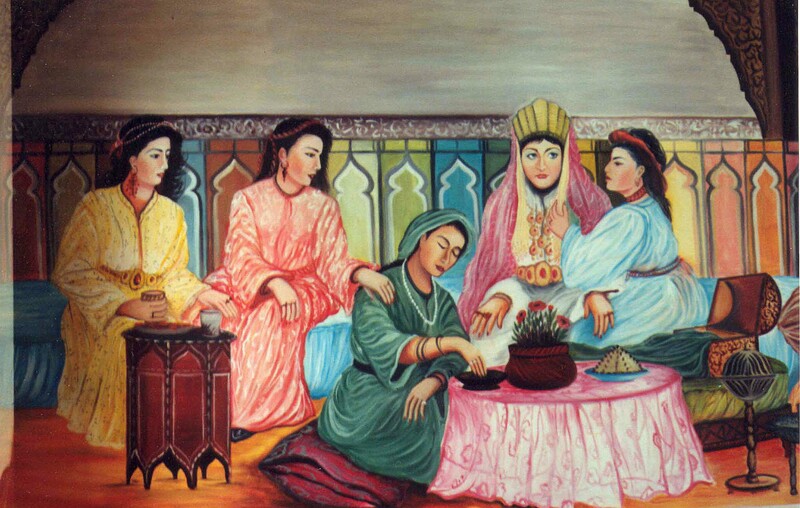 Your trip leader our Just for Women Tour will be a MoroccoTravel Specialist who has lived and traveled in Morocco for 12+ years. Morocco Tours for Women offer a greater way to discover Morocco through their unique and up close experiences with the people and the culture. Morocco Tours for Women also enable group and single travelers to visit Morocco anytime of year and with any budget. Luxury and adventure are affordable with Travel Exploration’s Just for Women Morocco Tour. Roam Like Royalty Through Morocco’s Imperial Cities was created for women by women to experience the wonders that Morocco offers. We’ll visit breathtaking architectural sites, majestic palaces, glorious houses of worship, opulent gardens, see traditional Moroccan crafts being made by local artisans, and shop a dazzling array of unique and enticing marketplaces. And we’ll enjoy exquisite cuisine and elegant accommodations all along the way of this magical voyage. Included in the Just For Women itinerary is a henna party and a ceramics workshop in Fes, an exotic cooking workshop in two Imperial Cities, a Hot Air Balloon ride over Marrakech’s Atlas Mountains, Camel Trekking in the Palmeraie of Marrakech, Spa time, Visits at women’s cooperatives, a wine tasting and more. Our group will rise and overnight at charming Riads & boutique hotels. Day 1: Casablanca: Visit the Hassan II Mosque, Kasbah Ouadia, Tea & Pastries at Cafe Maure, the Royal Palace & Hassan Tower. Lunch in Rabat by the sea. Visit the Kasbah of Chellah. Welcome Dinner. Overnight at a charming Riad in Fes with opulent gardens, tile work fit for a queen. Day 2: Fes:Visit the Sacred Tomb of Solica, the Weavers Cooperative. Workshops at the Women’s Embroidery Cooperative and Pottery Cooperative in Fes. Site seeing with a private expert guide of Fes. Lunch at the tiled Nejjarine Riad Palace. Overnight in Fes. 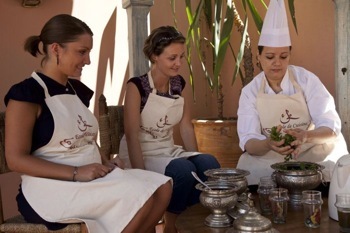 Day 3: Fes: Traditional Fes Cooking Class, Learn how to make a three-course meal, dine on it for lunch. 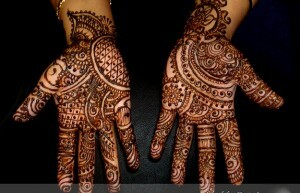 Henna party. Dinner at Le Maison Bleue in Fes. Overnight in Fes. Day 4: Fes t0 Marrakech: Visit Fes, Immozer, Azro and Beni Mellal. Stop to see the Cedar Forrest, the Barbary Monkeys. Tea & Pastries in Ifrane. Welcome Dinner upon arrival in Marrakech. Overnight in a luxurious Riad with an interior palmerie in the heart of the Marrakech medina. Day 5: Marrakech: Visit Marrakech’s most spectacular gardens, shop the souks. Site seeing with a private, expert guide at the Bahia Palace, Museum of Marrakech the Spice Market and gallery visits. Dinner at Al Fassia, a restaurant owned and run by women. Overnight in Marrakech. Day 6: Marrakech: Marrakech cooking class option – local cuisine of Marrakech. Visit the Mosque of Koutoubia’s Gardens. Shopping and exploration in the new town of Gueliz, Marrakech. Dinner with a Marrakechi family or at the colonial revival charming restaurant, Cafe La Poste. Overnight in Marrakech. Day 7: Marrakech: Marrakech Ballooning over the Atlas Mountains.1 Hour flight in front of the High Atlas Mountains. Souvenir flight certificate. Traditional breakfast served in a tent. Visit to a local Berber House.Landrover excursion. Camel ride in the Palmerie of Marrakech. Afternoon Spa time for a gromage and massage. Day 8: Marrakech – Essaouira: Visit Essaouira. En route take time out to explore a local Argan cooperative to see how Argan oil, Argan butter and cosmetics are made from the Argan nut. Wine & Cheese tasting in the countryside of Essaouira. Dinner by the sea. Overnight at a charming Riad in Essaouira with spectacular seaside views. Day 9: Essaouira: Visit Essaouira with a private guided tour. Explore the old mellah, ancient doors and their brass and hand carved knockers. 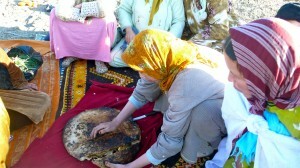 Visit a Moroccan Patisserie Cooperative run by women that referred to Association Feminine de Bienfaisance el Khier. AFBK is an organization providing help for women and children with social difficulties. Return to Marrakech at sunset. Farewell Dinner. Overnight in Marrakech. Day 10: Marrakech- Casablanca: Marrakech & Casablanca Departures. Sahara & Berber Village Extension Option Morocco Tours For Women:Extend the tour for a visit of Morocco’s Sahara Desert & Berber Villages. Continue the Morocco Tour for Women with exploration of ancient Kasbahs, hiking in and around the Todra Gorge, bake bread with the Berbers, Sunset Camel Trek & Overnight in a bivaouc in the Sahara Desert. Visit a Nomad family. Discover Morocco’s deep south. INCLUDED: Private Luxury Transport, Accommodations at 4 Star Riads & Boutique Hotels, Gourmet Breakfast Daily, National Historical & Local Licensed Expert Guides, Henna Party in Fes, Pottery Workshop in Fes, Cooking Workshop in Fes and Cooking Workshop in Marrakech, Hot Air Balloon Over the Atlas , Bellydancing Lessons, Wine & Cheese Tasting in Essaouira Winery, Museum & Monument Fees. CHARMING 4/5 STAR ACCOMMODATIONS: Fes: Riad Fes, Riad Myra or Riad Laaroussa, Marrakech: Le Jardin De La Medina, Riad Palais Sebban. Essouira: Riad Palais Des Ramparts, Villa Du Maroc. NOT INCLUDED: Lunch & Dinner Daily (Except where noted in Tour Program), Beverages, Services on days or time at leisure, Gratuity. You are currently browsing the archives for the Belly dancing Marrakech category.